I had visited the John Flynn Museum during my first visit to Alice Springs. On this trip, I visited his final resting place, shown in the photo below. Flynn founded the Australian Inland Mission, which he supervised until his death in 1951. He built the first hospital in Alice Springs, created a network of medical facilities across the outback, and created the Aerial Medical Service — which would in time renamed the Royal Flying Doctor Service. He also built homes for old people and crusaded on behalf of the Aborigines. 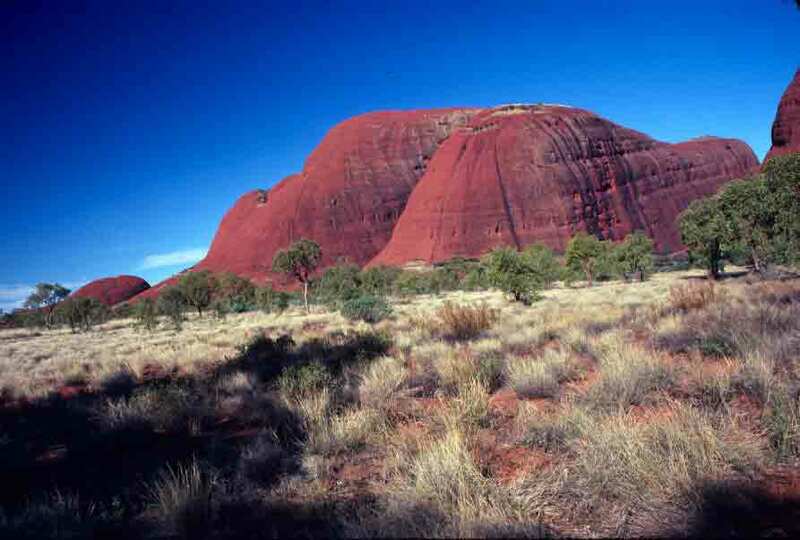 In fact, his medical facilities were equally open to Aborigines and whites, which was pretty startling in his day. He also wrote and published a magazine called the Inlander, which kept Australians apprised of both the issues facing people in the outback and what was being done to help resolve those issues. If you’re interested in more about John Flynn, the Australian Dictionary of Biography offers more details. Finally, we made it to Alice Springs. We camped just outside of town for a few days, while we explored the town and the surrounding area. 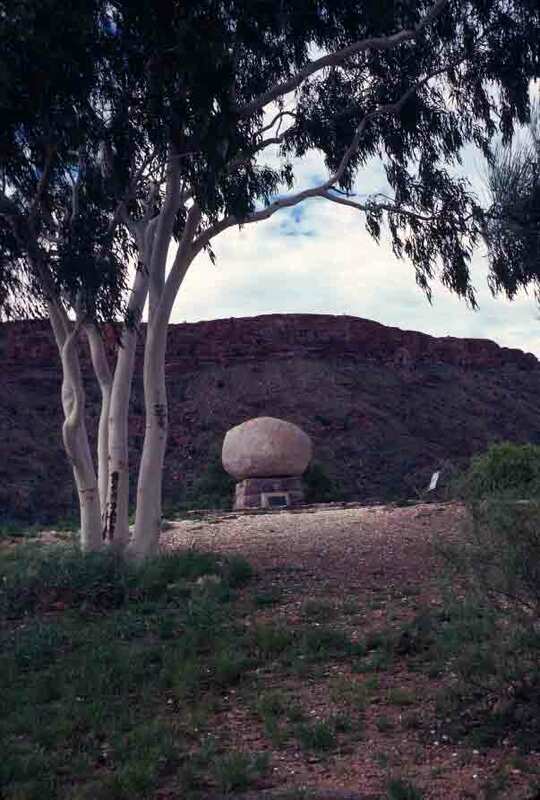 Driving west out of the Alice, we followed the east-west line of the ancient, eroded MacDonnell Ranges. Here, even more than elsewhere, the land seemed to have responded to the recent rain–though perhaps it’s just that it has now had a little more time to move from flooded to well-watered and verdant. One could still see the red earth, but it was blanketed in green. Wildflowers were abundant. It was lovely, though it seemed odd, having fallen in love with a drier version of this area. However, it was wonderful to see, and to be reminded how eager life is. After months and sometimes years of waiting, a bit of rain brings remarkable growth. Heading north, we crossed the Finke River. It is said by some geologists that this is the oldest river in the world. 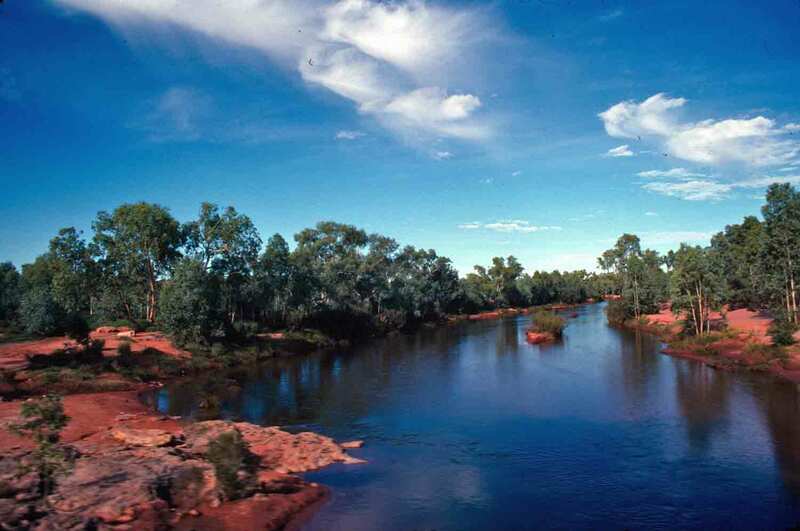 It is considered a major river of the Red Centre, but is also generally described as “intermittent.” That is, it’s only sometimes a river. The 400-mile-long river rises in the MacDonnell Ranges and winds down through Palm Valley on its way to South Australia. 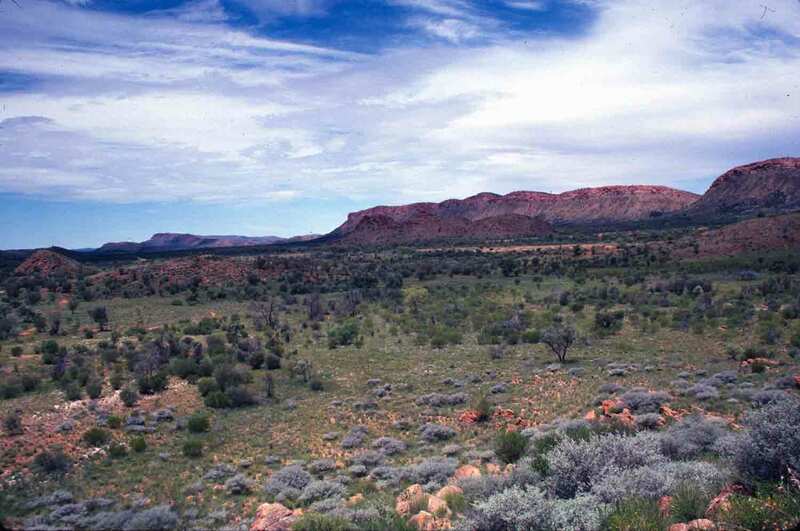 It was, in fact, along the dry bed of this very river that we drove (bounced, lurched) to reach Palm Valley, back in the winter, when I first visited the Northern Territory. Not too surprisingly, this time when we crossed the Finke River, it was looking a lot more like a river. It is said that it really only stretches its full length after flooding, and we had certainly seen an abundance of that. Water made the ancient watercourse amazingly lovely.